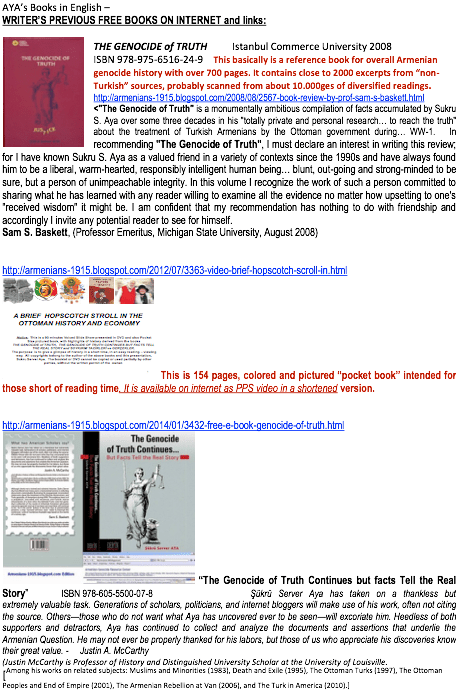 You are here: Home / AMERİKA BİRLEŞİK DEVLETLERİ – ABD / DOES FREEDOM OF THE PRESS GIVE EDITORS AND AUTHORS THE LIBERTY TO MANIPULATE? A profound old time scholar and friend of mine for some twenty years frequently shared my opinions and we joyfully co-authored several essays on historical past relations, Armenians, Turkish-German or other subjects. Having read the Wall Street Journal of Jan.25, 2018 by Mr. Robert M Morgenthau, me and my scholar friend Prof. Ata Atun, (with whom we published quite a number of essays (1) available on internet) decided to present this paper as a continuation of my book “Preposterous Paradoxes of Ambassador Morgenthau”(2) plus several essays related to Armenians, genocide, Morgenthau which are enlisted hereunder! Since several of our researches are primarily focused on “The Story of Ambassador Morgenthau” book, diary, consular reports, and other irrefutable written evidences, we decided to express our cross checked “findings” (not opinions) in this research refuting the contents of the article posted by Wall Street Journal and penned by a reputed ex district attorney or “lay authority” with respected ancestry. And yet, we are appalled and profoundly surprised by the contents of the article that appeared on Wall Street Journal on Jan. 25, 2018 by Mr. Robert M. Morgenthau, titled “Will Trump Tell the Truth about the Armenian Genocide?” This article by Mr. Morgenthau is plagued with so much bias and so many mistakes that we felt compelled to repudiate its contents and present our documented findings on the same issue. who was authorized to make this statement as the highest officer of the “old United Nations”! The absence of documented knowledge is no excuse! We feel that the respectable prestige of Mr. Morgenthau in Law as district attorney may be jeopardized by his blank accusations, not knowing history or ignoring legal requirements. In other words, Mr. Morgenthau implies that the idea of destroying Polish Jews was designed based upon the experiences of the (so called) Armenian Genocide. Hence the Museum covered the mistake they knew much earlier by deflection or simply giving the source, without cross checking its veracity or observing the deletion of this document from the Nuremberg Court. Furthermore, one cannot help but ask the question as to why a respectable museum would stoop to put up something on a wall which themselves apparently question by referencing to a dubious source. One cannot escape to conclude that it must have been for money. And it is an open secret that in fact an Armenian by the name of Seth Moomjian (actually Set Momjian) pledged $1 million dollars to put up that wall of disinformation. Now, the purpose of a museum is to inform the public the true history based on factual and cross-checked information, for otherwise it would be derelict in its duties as a museum. Just as importantly, they would be besmirching the memory of the horrible Holocaust for which the museum was built in the first place. It is ironic that what the museum has done is totally contrary to the mission of today’s #REMEMBER movement. The referred Hitler’s meeting of August 22, 1939 is explained in full contents in the colossal encyclopedic book on Nazi History “The Rise and fall of the Third Reich” (5) by William L. Shirer. There is no such sentence or any reference to Armenians. Furthermore, the actual meeting minutes that were jotted down and submitted to German Nazi Archives by some of Hitler’s top generals did not have the same contents. Prof. Lowry’s article (6) is a scholarly valid evidence and narration. Finally “Documents – The Military, Foreign Policy, and War “released by US Military”(7) provides full text of the subject speech, which are identical to the text of William Shirer’s book. Henceforth as readers of respectable WSJ and Mr. Morgenthau, we are entitled to receive a public explanation or apology for the following serious discrepancy which must be reconfirmed. (B) The deletion of the L-3 document (15) by the Nuremberg Court, plus Prof. Heath Lowry’s article, plus contents of the book “The Rise and fall of the Third Reich” and lastly the records of the U.S. Military ARE ALL WRONG ! WSJ and Mr. Morgenthau must be obliged to show the readers of the WSJ newspaper where and how they received their information for the article and answer the question as to WHICH ONE of the following IS TRUE: the Nuremberg Court files and the associated references given in paragraph (B) above NEGATING the Hitler quote as published in the WSJ article by Robert M Morgenthau or the quote as chiseled on the wall of the HOLOCAUST MUSEUM?? In general, the shallowness of the arguments coming from the USA is aggravated further by Mr. Morgenthau’s using the “religion card in favor of the Armenians” not being aware of what has been available on the internet for many years that < armenians soldiers in wehrmacht army photos>of 22,000 to 33,000 Nazi Armenian Legion soldiers in Hitler’s army fighting against USA and allies, under Armenian General “Butcher Dro”. 4,800 of this army were special SS troops which were functional in rounding Jews and sending them to death camps. Chapter 14/1 and 14/2 of reference (4) give descriptive and documented information about their devotion to Hitler until February 1945. Mr. Morgenthau as a profound Jew is praising the Armenians who rounded up the Jews in Europe. In contrast, it is sad (and perhaps inexcusable) that Robert M. Morgenthau seems to be unaware of many counts of Turkish diplomats(14) not only saving over ten thousand Jews and some even accompanying them for safety from Vichy France to Palestine on charted trains, not to mention thousands who were also saved on the island of Rhodes. It is almost impossible that Mr. Morgenthau never heard of the Jewish Professor Emeritus on Middle East History, Mr. Stanford J Shaw (8) teaching history in the UCLA University and whose house was bombed and set on fire by Armenian students in early 2000s and he took refuge to Turkey for safety. He passed away in 2006. It will be no surprise that both WSJ and Mr. Morgenthau never read an article by Mr. Shaw, detailing how the Jews with Turkish relatives in Turkey were saved by few Turkish diplomats at high risks. In regard to the population controversies, these are documented in the books and essay in footnote no.1 by Ata Atun. And of course, the bit about the “denialists” and “denial” issue, it is probably not worth to talk about it, because it simply is stupidity in its core. How can one be accused of being a “denialist” when the other side is accusing of something that never happened? How can one prove a negative? What is one supposed to do? Just take all the lies lying down ? “Denial” applies to something that is proven to exist physically or scholarly. Article IX of the 1948 United Nations Convention on the Prevention and Punishment of Genocide requires “verdict of an International Court of Justice” (10)! The UN has a special undersecretary and office “Genocide Prevention and the Responsibility To Protect | OSAPG” which specifically deal with charges of genocide by the members. The office and procedures are wide open to “evidence the human crime – genocide”. The drum-beaters of genocide propaganda know that they have no case to defend and bypass the OSAPG office, by symposium, conferences, articles and so much brain washing to escape established laws and written regulations. As far as the relief efforts Mr. Morgenthau is talking about, both WSJ and Mr. Morgenthau must read “the Near East Relief Report”(11), dated Dec. 31, 1921. On Page 5 of the report, under the title “general”, it is stated that “…at least 1,000,000 people, chiefly Armenians and members of the other exiled subject races are living in the Near East today…”. Hence, we shall leave it up to Mr. Morgenthau to prove following the joint French-Armenian Land Distribution Committee report of March 1, 1914 showing the total Armenian population in the entire Ottoman Empire being 1,288,000, how is it possible to kill 10.000 persons every day to reach 1.500.000 in 150 days while needing (where, when, how, why) stadium size graves every day, dug by 6.000 workers to dispose bodies. Was there any ever found, by the way? Boghos Nubar, the Armenian Leader living in France, in his letter to the French Foreign Ministry of Dec.3, 1919 wrote that the number of “relocated Armenians” was 600,000 to 700,000. The U.S. Near East Relief balance report indicates on page 5, that 1,403,000 Armenians were alive on 31 December 1921. Firstly, how is it possible to have 1,500,000 persons die (out of 1,288,000)? Secondly, since only 600,000 – 700,000 died during the relocation, then with a totally imaginary rate how can one arrive at a balance of 1.403.000 Armenian alive as written in the Armenian Memorandum given to the Paris Peace Conference on Feb.12, 1919. In a way, we thank Robert M. Morgenthau, the grandson of Ambassador Henry Morgenthau to the Ottoman Empire for giving us a chance to clear some of the miss and disinformation that has been propagandized for over a century now. We sincerely hope that this is a siren call to concerned people to set the record straight once and for all. <INTERNATIONAL JOURNAL of ACADEMIC RESEARCH> Vol. 5. No. 6. November, 2013 Atun, S. Server Aya. Part II: energy models comparative analysis.< International Journal of Academic Research Part B; 2013; 5(6), 225-232. (13) Text, “League of Nations Official Gazette, 21.9.1929”; declaration of Fridjof Nansen”. [Justin McCarthy is Professor of History and Distinguished University Scholar at the University of Louisville. Among his works on related subjects: Muslims and Minorities (1983), Death and Exile (1995), The Ottoman Turks (1997), The Ottoman Peoples and End of Empire (2001), The Armenian Rebellion at Van (2006), and The Turk in America (2010).